Early settler (and later postmaster) H. S. Shive is credited with naming Pansy. Originally called Pansy Mills (for two windmills that were located there), Pansy had been 12 miles S of Mt. Blanco. While Mt. Blanco was shown on early maps of the region, Pansy evidently didn't rate the cartographer's time. The post office was granted in 1894 although it only lasted until 1896. Residents of Pancy were actually on property belonging to the Kentucky Land and Development Company. A school district was formed in the early 1890s and managed to keep it's autonomy until 1936 when it merged with the McAdoo school. The Pansy Baptist Church (c. 1905) was damaged by fire in 1965 but remained active through the 1980s. 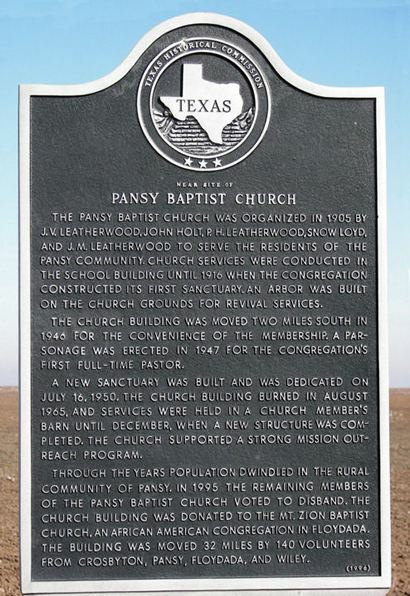 The Pansy Baptist Church was organized in 1905 by J. V. Leatherwood, John Holt, P. H. Leatherwood, Snow Loyd, and J. M. Leatherwood to serve the residents of the Pansy Community. Church services were conducted in the school building until 1916 when the congregation constructed its first sanctuary. An arbor was built on the church grounds for revival services. The church building was moved two miles south in 1946 for the convenience of the membership. A parsonage was erected in 1947 for the congregation's first full-time pastor. A new sanctuary was built and was dedicated on July 16, 1950. The church building burned in August 1965, and services were held in a church member's barn until December, when a new structure was completed. The church supported a strong mission outreach program. Through the years population dwindled in the rural community of Pansy. In 1995 the remaining members of the Pansy Baptist Church voted to disband. The church building was donated to the Mt. Zion Baptist Church, an African American congregation in Floydada. 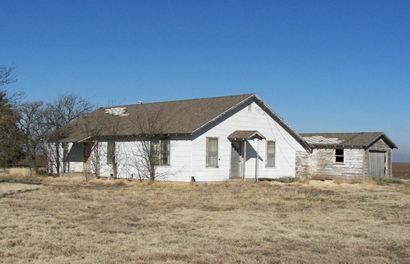 The building was moved 32 miles by 140 volunteers from Crosbyton, Pansy, Floydada, and Wiley. This area of Crosby County was settled in 1898 by the family and relatives of M. G. Leatherwood. As other families began to arrive, the need for a nearby school became apparent. As a result, the Leatherwood Common School District was created in 1912. The first classes, held in the spring of 1913 in a one-room schoolhouse on land donated by M. G. Leatherwood, were taught by Ellsworth Ham. The location of the school was changed twice before it was moved to this site at the eastern edge of the county. At the height of its growth, Leatherwood School employed three teachers who taught 36 students in a three-room schoolhouse. In 1935 the Zumalt School District consolidated with Leatherwood, but by 1945 only elementary students were being taught here. The final classes at Leatherwood were held in 1949, when the area was made part of the Crosbyton School District. 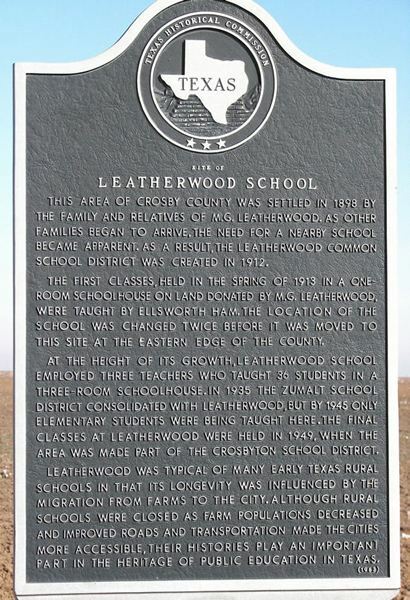 Leatherwood was typical of many early Texas rural schools in that its longevity was influenced by the migration from farms to the city. 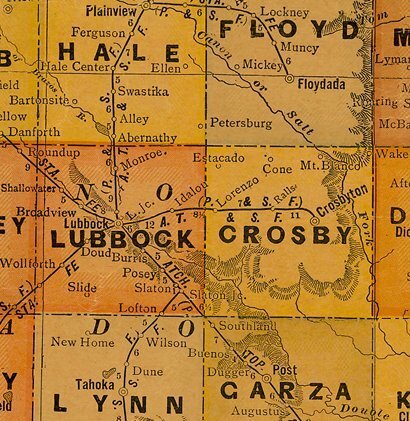 Although rural schools were closed as farm populations decreased and improved roads and transportation made the cities more accessible, their histories play an important part in the heritage of public education in Texas. 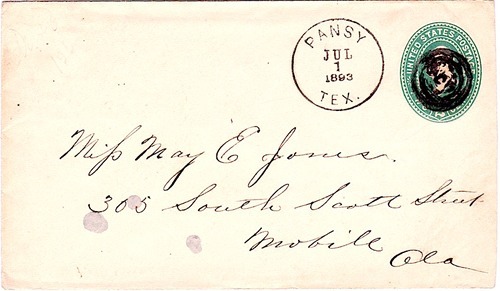 Cover cancelled with 1893 Pansy postmark. The brevity of operation of the Pansy post office makes this postal cover a very rare item.